REMINDER: NO morning meeting tomorrow (October 31). We do - however - have Happy Feet. There are a few volunteer slots still available. New shoes will be distributed to children identified by the social workers at Bluffton, Red Cedar, and M.C. Riley Elementary schools. Our Club is able to offer this great program to the Bluffton community thanks to our fundraising efforts as well as a grant from Rotary District 7770. 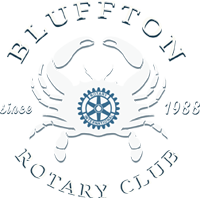 Additionally, our very own past president Jim Hudson's daughter, Emmie, has applied for Rotary Youth Exchange (2019-2020). In order for our Club to send Emmie as an "outbound" exchange student, your help is needed to identify three local host families for an "inbound" student. If you or anyone you know might be interested in hosting a student for three months next school year, please contact Jim Hudson or Dani Breidung.